NAFFCO leads the complete fire engineering solutions supply market for Healthcare and Education installations in the Middle East and North Africa (MENA) region. We use our expertise within the hospital fire protection industry to provide effective solutions that create a safer working environment for all users. Healthcare and educational environments have their own unique standards and regulations. NAFFCO has an advanced understanding of the various hazardous materials and chemicals that can reduce quality and safety or potentially prolong the length of development resulting in unnecessary costs. In addition to our thorough comprehension of regulatory standards, NAFFCO incorporates cutting edge technology, in all of its projects, recognized for advancing the healthcare and education industries further. 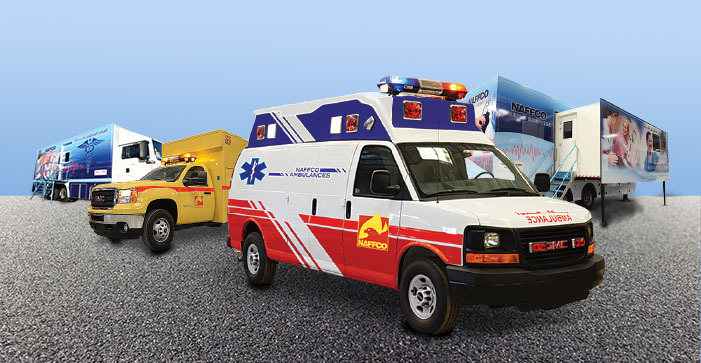 NAFFCO’s comprehensive selection of emergency response and medical products satisfies an endless number of industrial needs and remains an invaluable resource supply for healthcare service providers, medical practitioners, or any organization in need of emergency management or hazard mitigation solutions. NAFFCO Provides the highest caliber in ambulatory healthcare services to the medically unserved communities, rural areas, war affected, or mass causality, it also can provide the special needs for patients where it’s difficult for them to get the healthcare services. This mobile hospital provides the technology found in a typical modern hospital but allows you to deploy all of these services directly to the disaster area. Depending on your specific needs, this mobile hospital system can be designed and manufactured to meet the requirements of the community, state or country you are servicing and the services at the mobile facilities have been tailored under the mandate of the international standards to complement the range of healthcare services. NAFFCO Mobile Hospital can provide turnkey solutions of operational & functional hospital, in a compact, scalable, and climate-controlled mobile medical facility, providing Healthcare services, Health screening, Laboratory tests, Lifestyle and wellness care, Vaccinations. A combination of rapid deplorability and structural strength make NAFFCO units highly beneficial to a broad range of medical requirements, from highly mobile to long-term applications. Multi-clinics: Customized solutions can accommodate many clinics in one unit; facilities are available according to client requirements. Areas: Oil & gas fields, or unserved communities and occupational health areas. Blood donation unit: Comfortable work interiors with an excellent workflow design. Two to four or more donor beds are available according to client’s requirement. Areas: Country-wide awareness campaigns or unserved communities. Radiology units: Mobile radiology units are capable of travelling over both public and private roads. It may be parked for long periods and can be customized to facilitate X-ray, Mammography, or Ultrasound units are insulated to shield and protect people or objects from radiation. Dental units: A mobile dental clinic offers dentists the freedom to offer patients access to dental care anytime, anywhere. Mobile OR & ICU: Mobile Surgery Units (MSUs) are healthcare compliant mobile ambulatory surgical facilities it could be combined with ICU to reduce existing waiting lists of hospitals for day care treatment. Areas: War affected areas, Disasters, Rural areas, Villages, Unserved Communities. Pharmacy & Laboratory: These units have Mobile Healthcare treatment facilities to provide on-site medical pharmacy services for hospitals and clinics. Areas: Airports, Ports, Hospitals and Educational Institutes. Customized solutions: NAFFCO can cover all clinical specialties such as: Medical Health Screening, Outpatient procedure, Diagnostic Testing/ Laboratory, Dental Screening, Eye / Vision Clinic, Audiometry/ Hearing Lab etc. NAFFCO offers educational courses in conjunction with the National Fire Protection Association (NFPA) in our dedicated NAFFCO training center. NAFFCO drives the healthcare fire protection market in the Middle East forward through our intensive firefighter education programs. Courses are taught in Arabic and English. Every program teaches key elements of NFPA codes through discussions led by the actual drafters of NFPA code policy. Each NAFFCO educational course provides students with hands-on experience applying these codes to real-life situations through tutorials and on-the-job training. Seminars include a review, preparation and an examination where students are able to earn a Certificate of Educational Achievement. Each student must be able to illustrate a thorough understanding of code requirement concepts, and how each is applicable in their field of study, before receiving a certificate. We recommend all fire protection professionals attend this program especially: facility managers, designers, engineers, architects, risk managers, facility consultants, project managers and fire protection maintenance technicians. We recommend to individuals that work in building construction, protection, and occupancy fields to study the NFPA 101 – Life Safety Code. The course includes detailed strategies to enhance life safety in new and existing structures while reducing the effects of fire and related hazards. Our training programs are designed to offer life safety professionals a credible and recognizable qualification system with certification levels such as Basic, Firefighter I/II, Fire Officer I, Fire Instructor I, Safety Officer, Fire Officer Strategy and Tactics. By taking our courses, life safety professionals receive an extensive curriculum with learning objectives that boost career advancement in a wide range of fire protection engineering jobs. NAFFCO educational courses ensure all graduates meet the professional standards required by the National Fire Association.